To receive a message when we take local orders for flax seed, sign up for our emails. Flax seed contains a large amount of essential fatty acids like Omega 3, a vital fat that your body must have but cannot make on its own; it must get it from the food you eat. Flax seeds are a very good source of that particular substance, as well as fiber and important antioxidants. 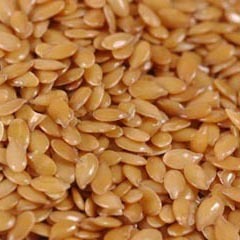 We offer flax seeds in 5 pound bags and 25 pound bags. Flax seeds can be added ground or whole to breads and other baked goods, or mixed into smoothies. It’s best to grind them in a small seed mill or coffee grinder. A VitaMix also works well. Do not grind flax seeds in an electric grain mill unless you combine them with a non-oily grain like wheat or rice (1 part flax to at least 3 parts non-oily grain). Flax seeds are too oily when ground alone and will clog up your machine.